Model of the Royal Navy City-class frigate by JLawson modelmakers. 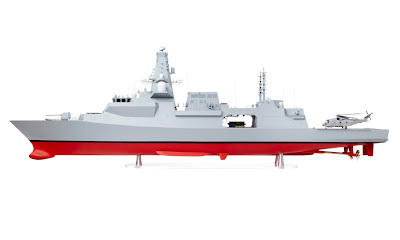 The following image, is a photo of a model of the future Royal Navy Type 26 class (or City-class frigate), which was created by JLawson Modelmakers and was modified by me, in order to report mainly the frigates' armament configuration. The City-class frigate is a class of eight frigates being built for the United Kingdom's Royal Navy. The ship design and manufacture program, known as the Global Combat Ship, was created by the UK Ministry of Defence to partially replace the navy's thirteen Type 23 frigates, and for export. It will be a multi-mission warship designed to support anti-submarine warfare, air defence and general purpose operations. The contract award to manufacture the Type 26 was announced by BAE Systems on 2 July 2017, with steel cut for the first of class, HMS Glasgow on 20 July 2017 by the Secretary of State for Defence, Sir Michael Fallon. 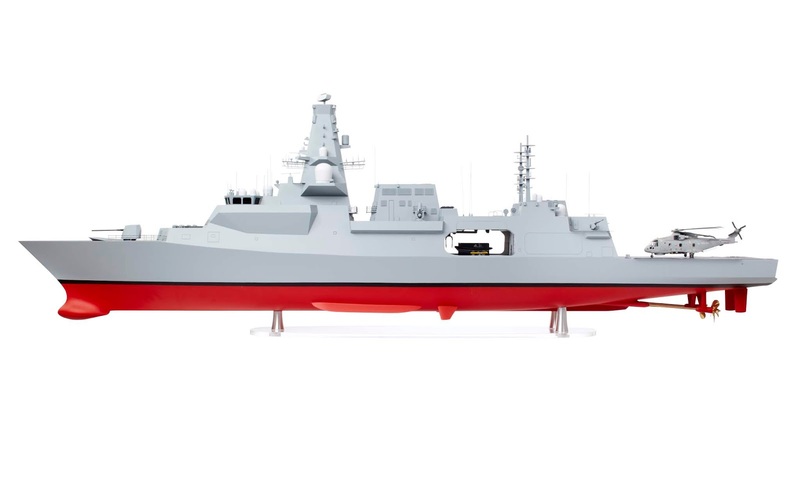 In June 2018, the Australian Government announced that it had selected a modified version of the Type 26 platform as the planned replacement for its Anzac-class frigate. This will see the Royal Australian Navy procure up to nine Hunter class frigates, which will be constructed by BAE Systems Australia at ASC's shipyard in Osborne, South Australia. Yesterday, on 19 October 2018, it was announced that BAE-Lockheed Martin had been selected as the winning bidder in the Canadian Surface Combatant program and that the Canadian government had awarded a contract for 15 ships worth CAD$60 billion. Infographic of the future City class (Type 26) frigate of the Royal Navy. High resolution image here. and TCG Saligreis (F246), in close formation. In this short article, similar to a complete analysis I did in the past on The major surface combatants of the most powerful European Navies in 2030, I illustrate the six most powerful surface combatant fleets in Europe by 2035 in a single graph, based on the shipbuilding programs that have announced and only. Russian Navy, as a naval superpower, is excluded from the graph. This time, the new graph, does not include only those countries that are located wholly or predominantly in Europe but also countries that exist partially within geographical Europe. Thus Turkish Navy is included as well. In this post, I will mention briefly some additions and changes regarding the previous article but I will not analyze more the developments and the designs, because I believe the beforementioned article covered the topic to a large extent. This is the seventh photo gallery (see previous posts) from my visit to Kiel, on the first weekend of the 136th Kiel Week. The Kiel Week (German: Kieler Woche) or Kiel Regatta is an annual sailing event in Kiel, the capital of Schleswig-Holstein, Germany. The first weekend of the Kiel Week, the famous Naval Base of Kiel, opens its gates for just four hours per day, for thousands of tourists who are eager to visit the German Navy warships and dozens of foreign warships which visit the city of Kiel, to honor the Kiel Week. Τhe Royal Navy was represented by a number of ships and craft, including the F235 Monmouth, the sixth vessel in the Type 23 class of frigates. The ships are named after British Dukes, thus leading to the class being commonly known as the Duke-class. The first Type 23, HMS Norfolk, was commissioned in 1989, and the sixteenth, HMS St Albans was commissioned in June 2002. They form the core of the Royal Navy's destroyer and frigate fleet and serve alongside the Type 45 destroyers. Originally designed for anti-submarine warfare in the North Atlantic, the Type 23 evolved into a more complex and balanced vessel optimised for general warfare, which introduced a host of new technologies and concepts to the Royal Navy. These included extensive radar cross-section reduction design measures, automation to substantially reduce crew size, a combined diesel-electric and gas (CODLAG) propulsion system providing very quiet running for anti-submarine operations along with excellent range, vertical launch missile technology and a fully distributed combat management system. 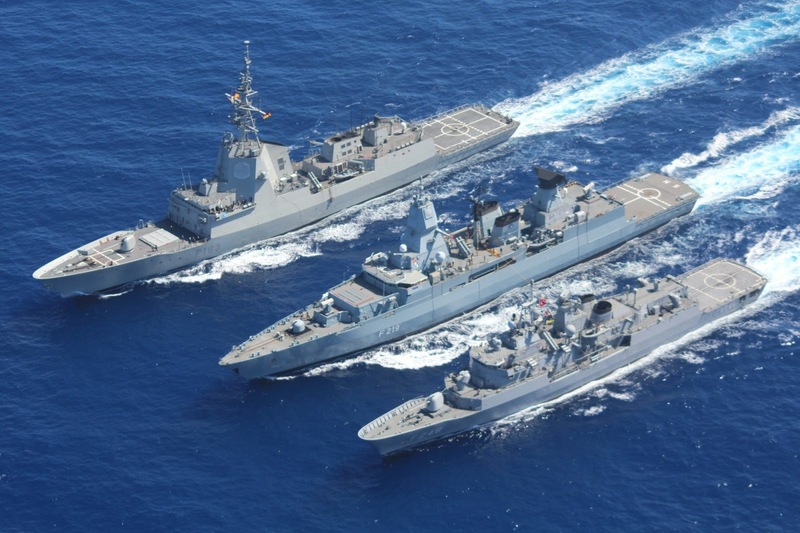 Thirteen Type 23 frigates remain in service with the Royal Navy, with three vessels having been sold to Chile and handed over to the Chilean Navy. Affectionately known as "The Black Duke", Monmouth is the only ship in service with the Royal Navy that has its name painted in black and flies a plain black flag in addition to the ensign. This is due to the dissolution of the title and the blacking out of the Coat of Arms of the Duke of Monmouth in 1685 following the Monmouth Rebellion against James II of England. As of 2018, Monmouth carries the most battle honours of any ship name currently serving in the Royal Navy. Enjoy my photos from my visit aboard the mighty HMS Monmouth! Miltech Hellas TDR-10 ADVANCED, the new Greek advanced electro-optical sensor! All photos were taken today during my visit to the company. 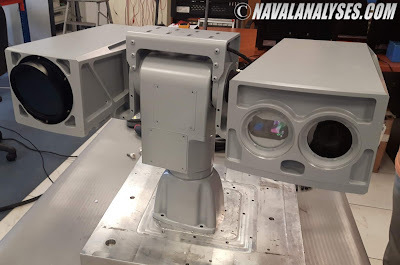 This is an update on the latest news regarding the equipping of Hellenic Navy warships with new electro-optical sensors. In the article The new eyes of the Hellenic Navy Fleet: Miltech Hellas TDR-10 and IRB-75, I reported that a sensor designed and produced by Miltech Hellas, the TDR-10 model, has equipped three Hellenic Navy gunboats and one frigate while 15 (!) more systems of the advanced model TDR-10A, a completely new system, will equip other warships of the Fleet (offset commitment by Raytheon). The TDR-10 electro-optical (EO) sensor has proved an excellent EO sensor after being intensively tested by the Hellenic Navy. The dual-axis gyro stabilized platform mounted system (pan-tilt unit HI-PTU100-DSG), designed by Hellenic Instruments, is equipped with a high performance 3rd generation cooled sensor with a high resolution detector, a laser rangefinder (up to 10km), motorized thermal lens, GPS and a high resolution day camera full HD. The whole system weighs less than 15kg while approximately 9kg is the weight of the pan-tilt unit. A terrific system all Made in Greece! This is the sixth photo gallery (see previous posts) from my visit to Kiel, on the first weekend of the 136th Kiel Week. The Kiel Week (German: Kieler Woche) or Kiel Regatta is an annual sailing event in Kiel, the capital of Schleswig-Holstein, Germany. The first weekend of the Kiel Week, the famous Naval Base of Kiel, opens its gates for just four hours per day, for thousands of tourists who are eager to visit the German Navy warships and dozens of foreign warships which visit the city of Kiel, to honor the Kiel Week. Τhe Spanish Navy was represented by the F101 Álvaro de Bazán, the lead ship of the Álvaro de Bazán class frigates, which was commissioned in September of 2002. The Álvaro de Bazán class (also known as the F100 class of frigates) is a modern class of Aegis combat system-equipped air defence frigates that entered service with the Spanish Navy the period 2002-2012. They were built in the Spanish factory of Navantia in Ferrol and are named after famous Admiral Álvaro de Bazán. The F100 design is the basis for the new Hobart-class destroyers of the Royal Australian Navy of which the two of the three ordered, are already in service with the Navy. Furthermore, in February of 2018, it was announced that a design based the class was selected as one of five finalists for the U.S. Navy’s FFG(X) program. The ships of the class thanks to their Aegis naval weapons system can track hundreds of airborne targets simultaneously and subsequently to guide dozens of anti-aircraft missiles they carry. Τhe usual load of anti-aircraft missiles is 32 SM-2MR and 64 ESSM in 48-cell Mk41 VLS. The rest of the armament consists of a 5-inch/54 Mk45 Mod 2 gun, two quadruple Harpoon anti-ship missile launchers, four 324 mm Mk32 Mod 9 twin torpedo launchers, two 20mm guns (additionally two Mk38 25mm guns on the last ship of the class), a variety of machine guns, while there is provision for one Meroka CIWS. Enjoy my photos from my visit aboard the mighty and state-of-the-art ESPS Álvaro de Bazán, the pride of the Spanish Navy!